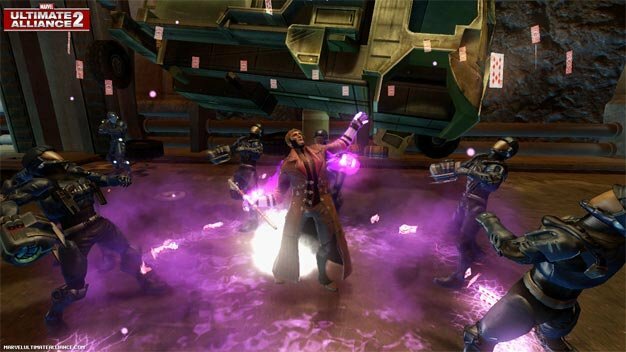 In theory, the Marvel Ultimate Alliance series lives up to its namesake, fulfilling Marvel fans’ ultimate fantasies of beating down enemies as their favorite Marvel superheroes. And as a sequel, Marvel Ultimate Alliance 2 is supposed to expand upon the strengths of its predecessor with new mechanics that live up to its RPG roots. But that’s just theory and more often than not, theory and real life rarely match up in perfect harmony. In real life, Marvel Ultimate Alliance 2 tries to improve on its predecessor with new gameplay additions and a streamlined user interface, but takes far too many steps backward with each attempt at evolution. 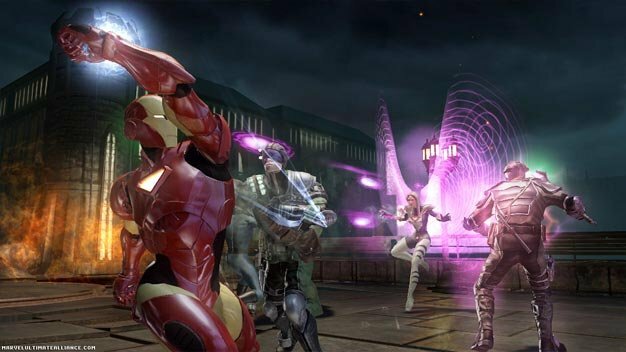 Marvel Ultimate Alliance 2 starts familiarly enough, with a squad of four heroes at your command. The squad members can be swapped out on the fly and switching between characters to control is as easy as pressing on the directional pad. Players button mash their way through uninspired level design, beating up countless enemies and helpless crates, earning experience points along the way. Those points are used to level up characters and their individual abilities. It’s all familiar ground for those who have played the first Ultimate Alliance or any other Diablo-like dungeon crawler. The sequel does introduce some new gimmicks to break up the monotony and familiarity of endlessly mashing away at attack buttons by bringing in Fusion attacks. Players fill up a meter by using normal attacks and once that meter fills up, they can unleash a tag-team attack where two members of the squad link up for a more powerful display of destruction. There are three types of Fusion attacks, depending on which two members are used. Targeted fusion attacks concentrate a single blow on an enemy, ideal for bosses. Guided fusion attacks are controllable charging maneuvers that can be used to clean up any stray enemies. Clearing fusion attacks will wipe out a wide area of enemies if things get too crowded. Even within the new concept of Fusion attacks is the very same monotony and familiarity it was meant to break up to begin with. Fusion attacks can be modified by mashing the attack button, much like every other attack at the team’s disposal. With 24 characters to choose from, there are hundreds of combinations to experiment with, but it soon becomes apparent that every fusion attack is condensed to basic canned animations. The Human Torch/Ice Man Targeted fusion attack looks and feels just as familiar as the Captain America/Iron Man fusion attack. Guided attacks look exactly the same, regardless of which characters you choose to combine. It’s a neat trick that will impress the first few times around, but loses its sheen with a bad case of deja vu. 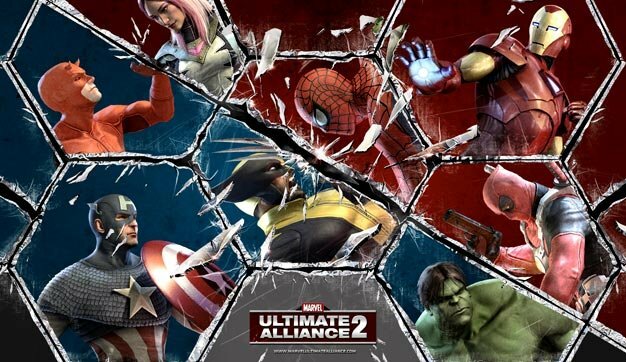 Marvel Ultimate Alliance 2 borrows from the Marvel Universe’s Civil War and Secret War story lines, bringing with it another change up to the series: branching stories. A retaliatory attack on New York by Latveria precipitated by a superhero-led charge on Latveria’s homeland leads to the Super Hero Registration Act, which requires every super hero to register with the government, reveal their secret identities and follow orders from government commanders. Naturally, not everybody is on board with the idea and the Marvel superheroes split into two different factions. Players will have to choose which side to fight on, a decision that is predicated solely on which superheroes players want to play with the first time around rather than any moral implications the story may suggest. The splintering of the superheroes contrives replayability that ultimately serves only the diehard completists as each faction offers very little in the way of different story lines or even level progression. With the exception of different sub bosses to deal with, both story lines play out the exact same way. The concept of choice permeates through dialogue scenes with equal impact to the overall story. Players can choose from three different types of answers during these scenes. They can be aggressive, diplomatic or defensive in their answers, but the choice doesn’t affect dialogue or the storyline. Characters react the same way regardless of what answer players choose. The fact that the character doesn’t actually speak the answers that are chosen suggests the attitude choices are simply tacked on. Although the idea flirts with morality and choice, it’s just a thinly veiled grind for extra powerups based on attitude choice. The greatest crime that Marvel Ultimate Alliance 2 commits is in its streamlined interface choices that betray its RPG roots. Players have less control over their allies, who will randomly attack enemies as they see fit. Outside of the Fusion attacks, there isn’t any sense of teamwork in the squad. Instead, it’s four super heroes wailing on bad guys level after level. Customization also sees a streamlined change sacrificing even more control over the squad. In the previous title, each character had several alternate costumes that possessed different abilities. This time around, each character has only one alternate costume and it’s purely cosmetic. Boosts are treated the same way, wherein they apply to the team as a whole instead of individual characters. Ability points can also be toggled to autospend, doing away with meticulous control over the details of superhero level-ups and turning the game into a mindless button masher. There’s enough unlockables and extras to warrant multiple playthroughs, as well as bonus trivia questions to distract gamers from the monotony of the campaign. Unfortunately, these extras appeal only to the diehard Marvel fans and obsessive completists. Marvel Ultimate Alliance 2 promises a lot of evolution in theory, but in execution, fails to improve on the series and sometimes even betrays its RPG elements in favor of a more streamlined and dumbed down interface. With basic dungeon crawl mechanics and contrived gameplay additions that fail to impress, Marvel Ultimate Alliance is successful only in its theoretical promises and suffers from the real life execution of those promises. + Fusion attacks are satisfying to pull off. + Branching story lines make for extended replayability. + Lots of unlockables and distractions to satisfy Marvel diehards. – Fusion attacks overstay their welcome with their canned animations and limited variety. -Although the branching story lines provide some replayability, they play the same way with no changes to the overall story. -The streamlined interface strips away the fundamental RPG elements that made the first Marvel Ultimate Alliance so great.